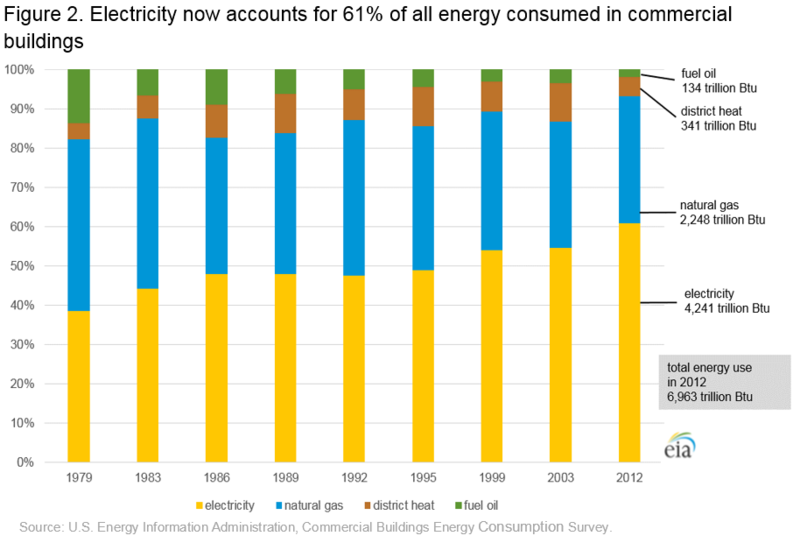 Source: U.S. Energy Information Administration, Commercial Buildings Energy Consumption Survey. Source: U.S. Energy Information Administration, Commercial Buildings Energy Consumption Survey 2012, March 4, 2015. 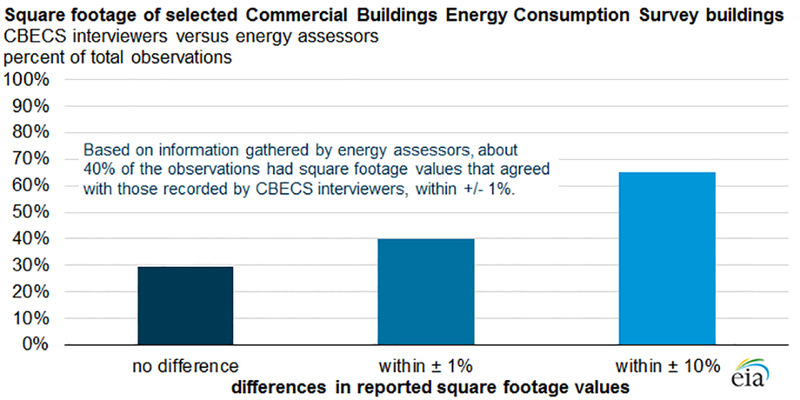 Source: EIA, Energy Assessor Experiment in the 2012 Commercial Buildings Energy Consumption Survey. Training for the field interviewers for the 2018 CBECS was held April 2-6 in Atlanta, GA.
Data collection began April 8, 2019 and will continue for about 8 months. Preliminary results will be available to the public in spring 2020. About 180 interviewers participated in a five-day training on CBECS. They were thoroughly instructed on all the steps necessary to find the sampled building, identify the best respondent, and complete the CBECS interview. For the 2018 CBECS, respondents now have the option to self-complete the survey via the web! For quality control purposes, an interviewer will still make an initial visit to each building. During the visit, interviewers will first validate that the building interviewed is the same one that was sampled. If not, the results will not be representative of the U.S. building stock. Second, interviewers will orient respondents to the purpose of CBECS and offer information about getting started via the web. In every case, interviewers will still be available on demand to answer any questions or to complete the interview in person, if desired. Was your building contacted to complete the CBECS? Go to www.CBECS2018.org for more information and to complete the survey. You will need a PIN. Over the past year, EIA has held CBECS outreach events via webinar, engaged in discussions with stakeholders, published a Federal Register Notice, and solicited input from building energy experts. After gathering all of this input, the 2018 CBECS questionnaire has been finalized and will soon be under review by the Office of Management and Budget (OMB). Here is a five-page summary of the questions—the document provides a comparison with the 2012 CBECS, showing which questions have been kept, removed, and added. In a future status update here, we will provide a document with the complete set of questions. Data collection will begin in April 2019. For the first time ever, respondents will have the option to complete the CBECS on their own via a website. EIA will still offer to conduct the CBECS in person with a trained interviewer for those who need or prefer that option. We expect to begin publishing data in mid-2020. EIA would like to thank those who participated in the stakeholder outreach webinars held in early March. We have used your feedback to modify the content of the 2018 CBECS. A short amount of time remains for comments on potential improvements to the CBECS questionnaire. With each new survey cycle, we make changes to keep the survey relevant, and we welcome your input. As you review the questionnaire (available with the FRN at the link above), use this overview of the 2018 CBECS and outline of the questionnaire, which highlights the changes made to date. EIA is planning the next Commercial Buildings Energy Consumption Survey (CBECS). The data collection period will begin in April 2019, gathering information for reference year 2018. Two notable innovations to the study are in the works. One is the introduction of satellite imagery and GIS tools to build the sampling frame. This virtual listing should save time and resources compared to traditional on-the-ground field listing methods. The other innovation is that the 2018 CBECS will offer a web option to building respondents, in response to feedback during the 2012 CBECS. The web option will allow respondents the flexibility to complete and submit their CBECS data when it is convenient for them and will provide automated methods to attach supporting documents. In the coming months, EIA will be soliciting input from stakeholders on planned survey content. If you wish to participate, please contact Joelle Michaels, CBECS Survey Manager, and indicate your area of interest. Regular project status updates will be provided throughout the CBECS 2018 survey cycle here. A new CBECS report, Trends in Lighting in Commercial Buildings, provides detailed information on lighting from the 2012 CBECS and reviews trends in commercial lighting going back to the 1995 CBECS. 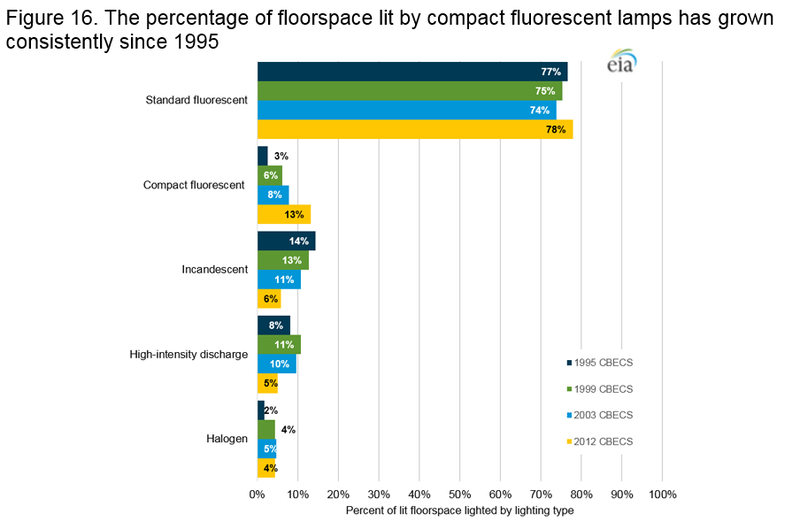 It compares the amount of commercial buildings floorspace lit by standard fluorescent, compact fluorescent, incandescent, high-intensity discharge, and halogen lighting across different building activities from 2003 to 2012. The report also provides information on lighting use by building size and on the use of lighting controls and control strategies. Estimates of water consumption in large (greater than 200,000 square feet) commercial buildings from the 2012 CBECS are now available in this report: Water Consumption in Large Buildings Summary. Included in the report are annual water consumption estimates (Table W1) and daily estimates (Table WD1). Additionally, a public use microdata file is available for users to perform custom analysis. For information on how the data were collected, see How was water usage information collected for commercial buildings? National-level estimates for 53 building activity subcategories are now available in five new tables. The CBECS Detailed Tables provide 16 categories for principal building activity, but the CBECS questionnaire actually collects around 100 different building activities. Not all of the subcategories have large enough sample counts to provide statistically significant estimates, but there are 53 subcategories that were already provided in the public use microdata files and are now pretabulated. For characteristics such as building counts, building size, operating hours, and age, see Tables PBA1 and PBA2, which are found in the building activity section of the building characteristics tables. For energy consumption estimates, see tables PBA3, PBA4, and PBA5, found in the major fuels, electricity, and natural gas sections, respectively, of the consumption and expenditures tables. For further information on the types of buildings included in each activity subcategory, see 2012 CBECS Building Activity Subcategory Examples and Definitions . Additionally, minor revisions have been made to Detailed Tables B1, B2, and C4. In B1, the calculation of the mean square feet per worker column was modified to exclude buildings with zero workers; in Table B2, the calculation of the median operating hours per week column was modified to include buildings that were never open; and in Table C4, the calculation of the building-level intensity percentiles were modified to include buildings that do not use any energy. The release of the CBECS consumption and expenditures data is complete. The 2012 CBECS consumption and expenditures detailed tables are comprised of tables C1-C38, which cover overall electricity, natural gas, fuel oil and district heat consumption, and tables E1-E11, which disaggregate the same energy sources by end use (heating, cooling, lighting, etc.). All of the detailed tables contain extensive row categories of building characteristics. The 2012 CBECS microdata files now contain additional variables for energy consumption and expenditures, in total, by energy source, and by end use. These files contain untabulated records for 6,720 buildings so that data users can create custom tables that are not available through the pretabulated detailed tables. They represent commercial buildings from the 50 States and the District of Columbia. Each record corresponds to a single responding, in-scope sampled building. The sample represents an estimated 5.6 million total buildings in the United States. Want to learn more about where the CBECS consumption estimates come from? See How Was Energy Usage Information Collected in the 2012 CBECS? The 2012 CBECS summary energy consumption estimates have been released. The tables present electricity, natural gas, fuel oil and district heat consumption in total, per building, per square foot and by end use. Each table has row categories for building floorspace, principal building activity, year constructed, and Census region and division. Within the next two months, EIA will be releasing additional tables with many more row categories and adding consumption and expenditures variables to the public use microdata files. Want to learn more about where the CBECS consumption estimates come from? See How Was Energy Usage Information Collected in the 2012 CBECS? EIA continues to work on end use modeling to complete the processing of the consumption and expenditures data. The projected release dates have been adjusted to account for the work remaining. The 2012 CBECS microdata files are now available for public use. These files contain untabulated records for individual buildings so that data users can create custom tables that are not available through the pretabulated Detailed Tables. They represent commercial buildings from the 50 States and the District of Columbia. Each record corresponds to a single responding, in-scope sampled building. The sample represents an estimated 5.6 million total buildings in the United States. There have been some improvements since the 2003 CBECS public use data release. The data file is no longer split up into groups, so one download will provide users with all the CBECS variables. Also, in addition to a CSV (comma delimited) file, the data are also available as a SAS data file. The files contain replicate weights so that data users can calculate standard errors. Detailed examples of how to perform these calculations can be found in an extensive User's Guide. And finally, the CBECS questionnaire has been annotated to be used with the public use files. EIA continues to work on processing the consumption and expenditures data. The projected release dates have been adjusted slightly to account for the work remaining. The Energy Supplier Survey (ESS) was conducted between March and October 2014, collecting data from energy providers of buildings in the CBECS for which energy usage data was not obtained from the building respondent. Now the ESS energy usage data is being combined and processed with the energy usage from the building respondents and end use estimates (the amount of energy used for heating, cooling, lighting, etc.) are being modeled. See About the CBECS for further description of the two phases of CBECS data collection. The remaining building characteristics tables (Tables B15 through B46) have just been released. These tables provide detailed information related to employment; building ownership and occupancy; energy sources used; and heating, cooling, water heating, lighting, and refrigeration equipment. There was a minor error detected in previously released totals for floorspace in the West North Central division within the Leased to tenants line in the Ownership and occupancy row category; that estimate changed from 1,357 million square feet to 1,364 million square feet, and the total U.S. floorspace for buildings leased to tenants changed from 26,093 million square feet to 26,100 million square feet. It should be noted that all the tables still contain preliminary data and many of the estimates are expected to change slightly when the consumption data are released near the end of this year. EIA continues to work on processing the consumption and expenditures data. The Energy Supplier Survey (ESS) was conducted between March and October 2014, collecting data from energy providers of buildings in the CBECS for which energy usage data was not obtained from the building respondent. Now the ESS energy usage data is being combined and processed with the energy usage from the building respondents. See About the CBECS for further description of the two phases of CBECS data collection. The first fourteen building characteristics Detailed Tables, an accompanying report, and survey methodology information - How was the 2012 CBECS buildings survey conducted? - have just been released. The remaining building characteristics data releases will include two more groups of Detailed Tables and the public use microdata files. The public use microdata files are building-level records provided for data users to perform individualized analyses. The data are inoculated so that it is not possible to identify any individual building on the file. EIA is concluding the second and final phase of CBECS data collection, the Energy Supplier Survey (ESS). Since March, EIA has been collecting data from energy providers of buildings in the CBECS for which energy usage data was not obtained from the building respondent. Now the ESS energy usage data will be combined and processed with the energy usage from the building respondents. See About the CBECS for further description of the two phases of CBECS data collection. The 2012 CBECS preliminary building characteristics were released in June. This preliminary data release includes building counts and total square footage by building activity, Census region and division, and building size category, and year of construction. The next release will be the Building Characteristics Detailed Tables; the tables will be similar to those published for the 2003 CBECS. We have evaluated the work remaining to ensure high data quality and adjusted the projected schedule of data releases as shown below. The Detailed Tables will be released in four groups; the table numbers shown below correspond to the 2003 CBECS tables. Please note that the table descriptions in the schedule below refer to the data presented as columns in the tables. Every table will have extensive CBECS data presented as rows, including building size, activity, occupancy, etc. The 2012 CBECS preliminary building characteristics have been completed! This preliminary data release includes building counts and total square footage by building activity, Census region and division, and building size category, and year of construction. The next release will be the Building Characteristics Detailed Tables, which will be similar to those published for the 2003 CBECS. In the last stage of building characteristics data release, the raw data files will be made available for public use. CBECS data collection is currently in its second phase, the Energy Supplier Survey (ESS). EIA is collecting data from energy providers of buildings in the CBECS for which energy usage data was not obtained from the building respondent. The ESS will be completed this summer, at which point the ESS energy usage data will be combined and processed with the energy usage from the building respondents. Energy consumption and expenditures data will be available beginning in spring 2015. See About the CBECS for further description of the two phases of CBECS data collection. 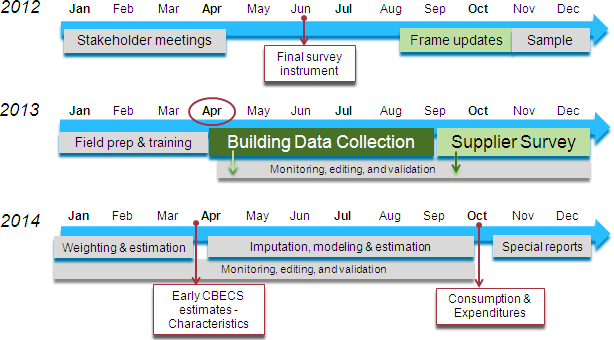 The first stage of CBECS data processing is almost complete and EIA expects to release preliminary building characteristics estimates by early June. This preliminary data release will include building counts and total square footage by categories such as building activity, Census region, and building size category. Next will be the release of Building Characteristics Detailed Tables, which will be similar to those published for the 2003 CBECS. In the last stage of building characteristics data release, the raw data files will be made available for public use. The active field data collection phase of the 2012 CBECS ended last week. In the next month, home office staff at Westat (the CBECS survey contractor) will continue to work on open cases via telephone interviews. With over 200 interviewers deployed across the U.S. starting in mid-April 2013, the 2012 CBECS was the largest field collection in the 30-year history of CBECS. Westat has been transmitting cases to EIA every few weeks since May, and the data editing phase here at EIA is making good progress. We are on track to publish the first characteristics results in late April or early May. The consumption and expenditures data releases will follow in about a year. The Energy Suppliers Survey (ESS) data collection begins in early spring: those data will provide energy usage and cost data for about half the CBECS cases. The CBECS interviewers have been in the field for 3 months now, and they have already collected data for about 4,500 buildings all across the country. Back here at EIA, CBECS staff are reviewing the data files as we receive them. The information collected in these interviews has already passed through and cleared two levels of automated data checks. Now, we're checking all the open-ended responses and interviewer comments and running case-level edits that check for item consistency within questionnaires and help to verify that the energy usage data are accurate. We're also gearing up for the CBECS Energy Suppliers Survey (ESS). In this follow-up survey, we will request energy use and cost data directly from the energy suppliers of electricity, natural gas, fuel oil, or district energy. ESS data collection is on schedule to begin in early spring 2014. The 2012 CBECS is in the field! Data collection for the 2012 CBECS began the week of April 15, 2013. About 250 interviewers are visiting buildings across the U.S. to collect data on their structure, operational characteristics, and energy use. In two recent four-day training sessions, the interviewers were thoroughly trained on all the steps necessary to complete an interview: determining if the building is in scope for the survey, making an appointment, gaining cooperation, using the computer to conduct the interview, and scanning utility bills. Who are these CBECS interviewers? They are professionals, but usually not energy experts. Many have worked on other large-scale surveys of various topics, while some are new to interviewing. Interviewers are an interesting, diverse group of people from all walks of life. Some of their previous or current other occupations include: accountants, firefighters, social workers, interior designers, caterers, military personnel, teachers, tax preparers, government workers, geological technicians, sales people, certified energy managers, dairy farmers, electrical contractors, DJs, architects, parents, and grandparents. The skills that they all have in common that make them effective interviewers are the ability to talk to respondents, an eye for detail, and a talent for organization. At least one interviewer is returning to the CBECS for the third time. After working on the 2003 and the 2007 CBECS, this particular experienced interviewer was happy to be back: "This is my favorite project! I find that the majority of the respondents are cooperative. Many have gotten the Advance Package of materials and are happy to talk about their building." Data collection will continue for approximately the next 6 months. assignment being put together.The start of the 2012 CBECS field period is just over a month away, and there is a lot of activity occurring right now in preparation! Over 12,000 buildings across the U.S. have been selected to be interviewed (see How Will Buildings Be Selected for the 2012 CBECS? for more information on sample selection). The CBECS contractor, Westat, is hiring about 300 field interviewers who will visit each of these buildings to determine eligibility for the CBECS. Then they will conduct interviews—either in-person or by telephone—using a survey instrument on a laptop computer. See the final version of the 2012 CBECS questionnaire. The CBECS interviewers will be trained in-depth to ensure that high quality data are collected. They will begin their training with distance learning modules to acclimate them with the CBECS and energy concepts before they travel to the in-person training. At the beginning of April, they will attend a four-day in-person training session in Los Angeles where they will learn the ins-and-outs of the CBECS interviewing process and the questionnaire. They will get lots of practice with the survey instrument before they hit the streets as soon as they return home from training. Meanwhile, back at Westat's home office in Rockville, MD, staff are working hard to make sure the behind-the-scenes logistics are in place. Materials for each case assignment are carefully being put together, including maps and other forms that will allow the interviewer to find the sampled buildings. Each respondent will be provided a package of materials about the CBECS when they are first contacted. Among other items, this package contains worksheets to help the building respondents prepare for the interview and a list of organizations that have encouraged participation in the CBECS . The "area frame" for the 2012 CBECS is complete! Over a 3 month period, 90 field listers created lists of buildings in 307 area segments by walking or driving through every street in these segments and recording every commercial building eligible for CBECS. Of these segments, 257 are new to the 2012 CBECS and 50 were in the 2003 CBECS and are now updated for changes since 2003. There are an additional 461 segments that were listed in 2003 that will also be part of the area frame. See How Will Buildings Be Selected for the 2012 CBECS? for more information on how the sample frame is constructed. EIA and Westat are preparing these lists for the statistical sampling of buildings that will be selected for the 2012 CBECS. The sampling phase is expected to be completed in January 2013, and data collection remains on schedule, with a start date expected in April 2013. After reviewing 400+ suggestions from stakeholders, the proposed 2012 CBECS questionnaire is currently under review by the Office of Management and Budget (OMB). The survey is administered using a computerized survey instrument, but we've provided a paper representation of the questionnaire (240 pages) and a summary of the major changes (7 pages) here. Because the computer automates all the question skip patterns, the survey is not as long or complicated as it appears! A major milestone in the 2012 CBECS sample frame construction is complete! EIA and Westat, the CBECS survey contractor, trained the listers, which are the field staff that will create the area frame portion of the sample frame. See How Will Buildings Be Selected for the 2012 CBECS? for more information on how the sample frame is constructed. Two training sessions of three and a half days each were held in Bethesda, Maryland from September 6 through September 12, 2012. About 90 listers from across the U.S. were trained using a mix of classroom education and practice listings around the streets of Bethesda. They learned all about EIA, the CBECS, and how to canvass their assigned geographic areas to list all CBECS-eligible buildings and record the information that is needed to select the sample of buildings that will be interviewed. The field listers' hard work and attention to detail will ensure that the sample frame is accurate and complete. They are enthusiastic about working on CBECS and ready to begin their assignments. One field supervisor with many years of experience on various surveys said: "I can't think of a more important study to be working on right now." The listing is now underway and will be complete in November 2012. The sample, significantly larger than previous cycles, will be selected in January 2013 and the interviewing of the sampled buildings will begin in April 2013. The 2007 round of CBECS was the first time in the 30 year history of CBECS that commercial buildings were surveyed about water consumption and characteristics. These questions were experimental, and EIA found the collection of this data to be successful. See Water Data Collection in the 2007 CBECS for details. EIA plans to collect water consumption data again in the 2012 CBECS. Though most of the data collected as part of the CBECS 2007 cycle could not be released, EIA has been able to produce data on energy characteristics found in large hospitals in 2007. 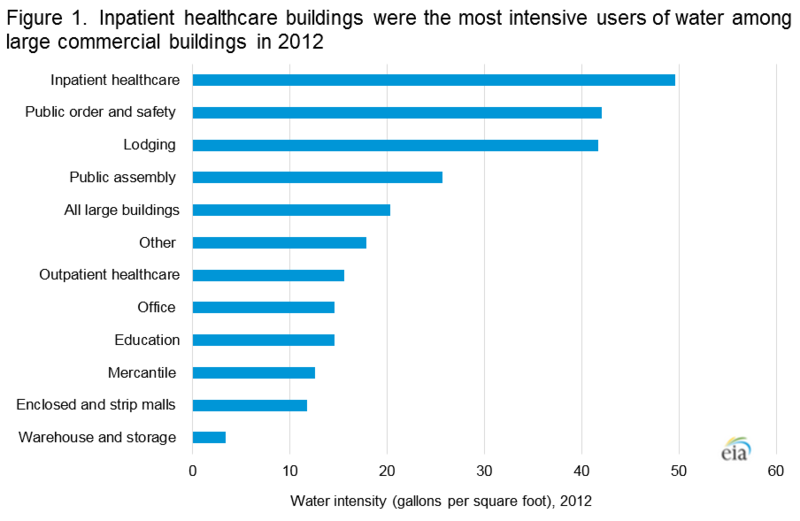 The data include estimates of building characteristics, energy sources, end uses, energy management features, energy consumption, and water consumption for hospital buildings greater than 200,000 square feet. See Energy Characteristics and Energy Consumed in Large Hospital Buildings in the United States in 2007 for a discussion of the estimates, table list for detailed tables, and 2007 CBECS Large Hospital Building Methodology Report for a methodological report. EIA and the CBECS survey contractor (Westat) are working hard right now to create the CBECS sampling "frame," which is the list from which buildings will be randomly selected to be interviewed. For the details of how the CBECS sampling frame is constructed, see: How Will Buildings Be Selected for the 2012 CBECS? EIA thanks the U.S. Green Building Council for hosting an informative 2012 CBECS Stakeholder Meeting on May 15, 2012. We had about 20 participants attending in-person and another 40 or 50 participants via webinar, representing a variety of industries – government, trade associations, real estate, energy consultants, advocacy groups, architects, engineers, laboratories, and equipment manufacturers. EIA presented our planned changes to the 2012 CBECS questionnaire and took comments from the audience on each questionnaire section. PowerPoint slides from the meeting. The last steps before the questionnaire is finalized are to (1) write all the new questions according to best practices for survey design and then (2) program them into the CBECS survey instrument. The CBECS is administered by a trained interviewer using a laptop and a structured survey instrument. The questionnaire is programmed in-house by EIA using a survey processing language called Blaise. We are hard at work reviewing all the great feedback on the 2012 questionnaire that we've received to date. So far, we've heard from: the U.S. Green Building Council, ASHRAE, members of the Real Estate Roundtable (RER) such as Tishman Speyer, Simon Property Group, and Transwestern, the American Institute of Architects (AIA), EPA Energy Star, EPA Office of Water, National Renewable Energy Laboratory (NREL), Consortium for Energy Efficiency, Energy Performance Measurement Institute, San Diego State University, BuildingWise, Lutron Electronics, SRG Partnership, Performance Buildings Systems, Grundfos, National Trust for Historic Preservation, and Center for Environmental Innovation in Roofing. Thank you all for taking the time to review the questionnaire. CBECS is back, and we want your input! We have created this CBECS section to provide updates on the survey progress. Contacting the CBECS Survey Manager, Joelle Michaels. We will post updates on the progress of the 2012 CBECS according to the timeline below. Following the suspension of the 2011 Commercial Buildings Energy Consumption Survey (CBECS) given insurmountable funding constraints in FY 2011, EIA has resumed preparations to conduct the next Commercial Buildings Energy Consumption Survey (CBECS). EIA plans to field the survey in April 2013, collecting data for reference year 2012. EIA expects to publish the first results of the survey in the first half of FY 2014. EIA is now working with stakeholders to develop the survey instrument. EIA will provide regular project status reports to the public throughout the course of the project. EIA previously reported that the CBECS 2007 data do not meet EIA standards for quality, credible energy information. As a result, EIA will not publish complete data tables from CBECS 2007 or release a public use file. EIA's status reports for CBECS 2012 will report on risk mitigation strategies undertaken to assure the delivery of CBECS 2012 data. For further information, please contact Joelle Michaels, CBECS Survey Manager, or by phone at 202-586-8952; or Tom Leckey.